Inflatable Zoo Animal Assortment. Kids will roar and go wild for these fun vinyl zoo animals! These critters are fun, playful creatures! These make great gifts or decorations for a child’s room. 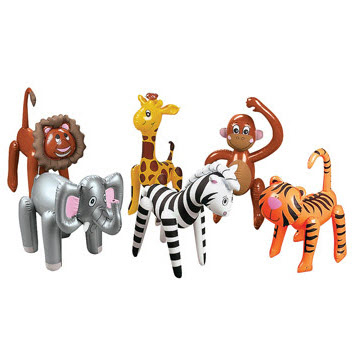 This inflatable assortment includes a monkey, lion, tiger, giraffe, zebra and elephant! Inflated, 16" - 25".